Such was the threat of terror from the air in Britain that even before the Wehrmacht struck against Poland on 1 September 1939 very many thousands of people were suffering the first inconveniences of war. Not only were large numbers of militiamen and reservists called to report for fulltime duty, large numbers of children and adults were evacuated from major cities considered most vulnerable to German air attack. (seventeen killed, thirty-three injured). Therefore, a total Luftwaffe offensive using gas, explosive and incendiary bombs would bring 200,000 casualties in one week, 60,000 of those fatalities. In the event, though some night raids on cities caused more casualties even than those suffered by the Germans under far greater RAF assault, overall casualty figures were lower than expected: almost 30,000 were killed in London throughout the war, for instance, 60,000 in all. Most of the great numbers of cheap coffins quietly made and stored before the war were not needed. Nonetheless, in 1937 the government was correct to make ARP (air raid precautions) a compulsory matter, as were the Germans. Through an Act of Parliament local authorities were compelled to take action in setting up appropriate organisations to deal with air raid emergencies. How they coped is beyond the scope of this work; what is relevant is the `knock-on’ effect which resulted from the fear of air attack at the top, leading to widespread anti-raid propaganda through various effective means such as cigarette cards. And when war finally came, the nervous state of the government resulted in the immediate closing of all places of entertainment, a panic measure that brought a depressing loss of morale and was soon rescinded. In fact, Nazi propaganda – and, of course, the terrible bombing of Guernica by the German Condor Legion Heinkels during the Spanish Civil War – had helped to establish the air raid neurosis in British leaders, especially Winston Churchill, who felt that in certain circumstances the Germans would be unable to resist using mass air terror to cow the enemy. All of these prognostications were not upset simply because the Luftwaffe failed to show up when war was declared. The false alarm sirens of 1 September did nothing to alleviate matters; the Lord Chancellor’s declaration in December 1938 that Hitler’s air force was capable of delivering 3,000 tons of bombs in one day was still taken seriously. News of the swift subjugation of Poland and the Luftwaffe’s part in it, including the blitz on Warsaw, simply amplified such notions. Preparations in ARP begun in 1938 included the digging of deep trenches in public parks; these were abandoned to the elements following Chamberlain’s `triumph’ at Munich which `solved’ the crisis over Czechoslovakia. As soon as the real thing came a year later the workmen were turned out again to drain the trenches and turn them into proper air raid shelters. In the armed forces, while the Royal Navy had always been seen as Britain’s first line of defence, in the modern age the comparatively new Royal Air Force protected our skies from aerial incursion, though judging by the experts’ views on probable air raid casualties the government held little faith in the RAF’s ability to hold back enemy bombers. Aiding the 750-strong fighter force were the `barrage’ balloons of a command only set up in 1938, plus a woefully inadequate Anti-Aircraft Command. Fighter Command was organised into thirty-nine front-line squadrons, with 400 planes in reserve. Of its first-line strength 347 were Hurricanes and 187 Spitfires, the rest made up of obsolete biplanes and the new twin-engined Blenheim Mk Is. Among the biplanes were seventy-six Gladiators, some of which would be called upon to combat the modern Messerschmitts of the Luftwaffe in the Norwegian campaign the following year. Air Chief Marshal Sir Hugh Dowding estimated that forty-six fighter squadrons would be needed to combat German air attack on Britain, but soon after war came he was obliged to despatch some of his Hurricane units to France. The RAF’s fighter interception force relied on a system of ground control, at the heart of which lay advanced warning of attack by the new and secret radar system: eighteen Chain Home (CH) units covering the east and south coasts of Britain, from Aberdeen to Portsmouth. The Germans also had radar (radio detection and ranging), but had so far failed to develop it into a fighter control system. British radar posts, in theory, would give warning of incoming raiders up to 100 miles distant at whatever height except low level. Aiding the existing anti-aircraft lookout posts were the highly skilled volunteers of the Observer Corps. The system was much more extensive in coastal coverage than that eventually organised in World War I when the Army and police were the chief planks of defence warning, but the radar sets themselves were untried in war and crude by later standards, and of course the operators were inexperienced, Fighter pilots, too, were quite naturally inexperienced, and would take time to learn the techniques and skills necessary for defence and survival in air combat. It was these shortcomings that led to the so-called `Battle of Barking Creek’. Belief that fear of air attacks was justified came early. The crowded streets of central London emptied quite rapidly when, not long after Prime Minister Chamberlain’s sombre announcement of war, the eerie cadences of the air raid sirens began to howl across the capital and southern England. Thousands hurried to the nearest shelter; the few who through bravado tried to remain, gawking in the streets, were bullied away by harassed and nervous policemen. As a demonstration of how the British public would behave under threat from the air it was admirable, and when soon afterwards the single wailing note of the `All Clear’ came, the crowds emerged relieved and smiling into the Sunday morning sunshine. The cause of the alarm had been an unidentified civil plane crossing the Channel, but that night other areas along the East Anglian coast suffered more alarms as jittery defence posts made more errors. A further alarm followed the next day. Then, soon after six a. m. on Wednesday, 6 September, the CH radar station at Canewdon near Southend-on-Sea, Essex, began recording `enemy aerial activity’ over the North Sea. It appeared that groups of up to twenty German aircraft were heading in towards the Thames estuary. Fifteen minutes were needed to confirm that no RAF planes were in that area, so the plots were accordingly marked as `hostile’ and the air-raid sirens began to wail in the zones to be affected. It looked as if the first, expected, mass enemy air attack was becoming a reality. Then, AA units on the Essex coast reported aircraft near West Mersea, and the whole British defensive system swung into action. The 11 Group sector controller, Group Captain Lucking, alerted the Hurricanes at North Weald to scramble a flight of fighters to investigate, put the adjacent 12 Group on alert and advised the Observer Corps of his actions. Contrary to orders, the station commander at North Weald promptly ordered his entire fighter strength into the air; twelve serviceable Hurricanes of 56 and 151 Squadrons scrambled, soon followed by two more excited pilots who flew after the main formation but trailed behind one thousand feet lower. It would be this luckless pair who suffered as the episode took on fiasco proportions. The Hurricanes began patrolling the line Harwich-Colchester, the eyes of every pilot straining to catch a glimpse of the enemy they fully expected to see at any moment. In the meantime, at 06.45 hrs twelve Spitfires were scrambled from 54, 65 and 74 Squadrons based at Hornchurch and flew east to intercept the `enemy’ raiders. As they reached the mouth of the Thames they spotted their `prey’ and the cry `Tally-ho!’ was given by 74 Squadron pilots, who at once went into the attack. The future Air Commodore Donaldson, then the leader of 151 Squadron, watched in disbelief and then horror as immediately after he called `Bandits!’ and ordered his pilots to await verification, he realised the `enemy’ coming at them were Spitfires. Two of the latter, flown by Flying Officer Byrne and Pilot Officer Freeborn, attacked some of the Hurricanes, this despite having the rising sun in their faces which had prevented positive identification. Pilot Officer Hulton-Harrop was struck in the head by a bullet and died; his Hurricane went down in a gentle glide, over Essex and into Suffolk, to crash on Manor Farm, Hintlesham. Had his fighter been fitted with head armour it is most likely he would have escaped injury. His fellow airman, Pilot Officer Rose, escaped injury, but was forced to land at Whetstead in Essex. More confusion occurred when AA gunners opened fire on 65 Squadron Spitfires off the coast, this despite the pilots flashing the correct recognition signal in Morse. In the subsequent inquiry, it was found that the ground gunners were young, unable to read Morse, and woefully ignorant in aircraft recognition. Indeed, the Observer Corps personnel were far from being up to standard themselves. During the episode, these watchers had received reports from the radar post of incoming enemy planes, but had been unable to see or hear any at all. Group Captain Lucking was relieved of his command the same day and taken under close arrest to Air Vice Marshal Keith Park’s HQ. The offending Spitfire pilots were also placed under arrest, while Pilot Officer Rose flew to Hornchurch the same day to give evidence. Reports that twin-engined Blenheims had been responsible in the first instance for this episode, a story published long after the war by one eminent researcher, seem to be untrue. As for the radar crew at Canewdon, their records, if any, have long since vanished. 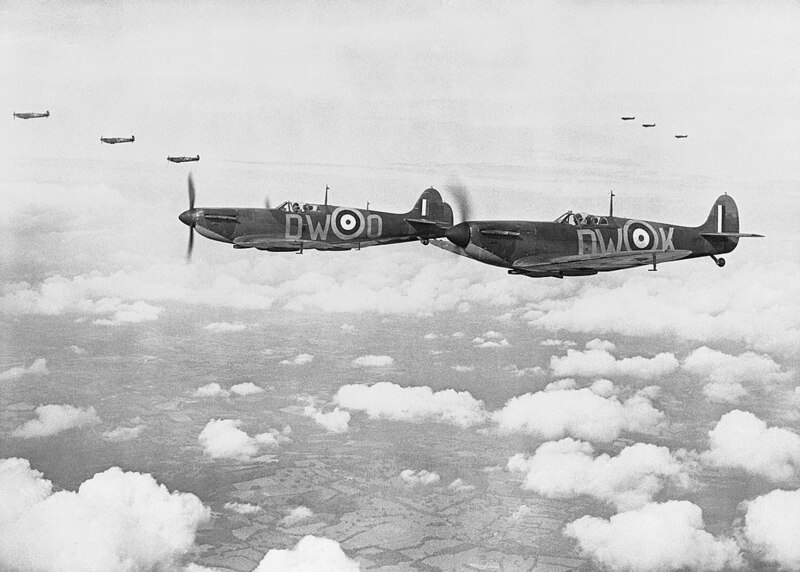 In his history of Hornchurch fighter base, Raiders Approach!, Squadron Leader Sutton OBE commented that it was `unsurprising’ Spitfire pilots and AA gunners should have been so trigger-happy in the first days of the war, when it seemed `inconceivable’ that Hitler would refrain from launching mass air attacks on Britain. Fighter pilots were by nature aggressive and quick off the mark, but Sutton states it was AA bursts around Hurricanes which alerted the Spits and brought about the attack. The early usage of ground-to-air radar at Canewdon had resulted in a fluke: echoes from the west were somehow reflected as if from the east and not filtered out. The incident led to better practice and the introduction of identification, friend or foe, devices in RAF aircraft. And this was by no means the only melee of the war between friendly fighters of either side. The Luftwaffe indulged in the Battle of Koepernick, and four days after Christmas 1939, the British defence system erred again – with serious results. Spitfires of No. 602 (City of Glasgow) Squadron were scrambled from their base at Drem, east of Edinburgh and near the sensitive Firth of Forth, after a warning of `bandits’ heading in from the sea. Although only just after three p. m., dusk was falling and there was sea mist, neither helping visibility. Despite these conditions, the intruders were spotted and the RAF pilots zoomed in for a first attack. One after another the Spits roared in, each pilot thumbing his gun button to set his eight .303 machine-guns chattering, sending streams of lead at the alarmed crews of the twin-engined, twin-tailed machines now trying to escape only one thousand feet above land. Only as the Spitfires broke away past their targets did the terrible truth dawn on their pilots: the `bandits’ were RAF Hampdens. By then it was too late; two of the friendly bombers were going down. The survivors were almost out of fuel and made emergency landings on the fighters’ own base at Drem, their crews soon facing their chastened attackers. It seems liaison between Bomber Command – who had despatched the Hampdens on an exercise – and the defence system was not as it should have been. Next morning the fighter pilots rose, went to attend to their ablutions and found all the toilet rolls gone. The bomber boys had already taken off, but soon roared back over the fighter field – to bomb it with toilet rolls. By July 1942, the officer commanding the famous Biggin Hill fighter station in Kent was Group Captain `Dickie’ Barwell. Misidentification in air combat had become a problem: twenty-five Allied aircraft had been shot down in error. Group Captain Barwell promoted recognition contests to help counter the situation, only to become a victim himself. When a `bogey’ was reported over the sea, Barwell took off in a Spitfire Mk VI, despite the fact he had broken his back and was still in plaster; he was accompanied by Squadron Leader Bob Oxspring. They failed to find the enemy plane but were themselves attacked by two Spitfires from Tangmere. Hampered by his plaster cast, Barwell was trapped in his blazing fighter and fell into the sea. The Third Eagle Squadron of American volunteer pilots trained on Spitfires had unfurled their flag at Biggin on 3 May in the same year. By September, these pilots were about to transfer to the US Army Air Force, and in the middle of that month flew what was to have been their final operation before donning American uniforms. It proved more than that. In one of the most incredible episodes in the history of air warfare, the whole squadron of twelve Spitfires was blown wildly off course over the Channel by a vicious headwind, and the pilots failed to realise this until they emerged from cloud to find themselves over Brest. Taken on by the heavy German flak defences, the Spits were damaged and, out of fuel, were forced to make emergency landings. The French lie de France Group would never take over the Eagles’ mounts: the aircraft and the American pilots were captured by the enemy. Only one of the pilots managed to escape. He headed north towards Cornwall, only to crash into the cliffs at the Lizard.